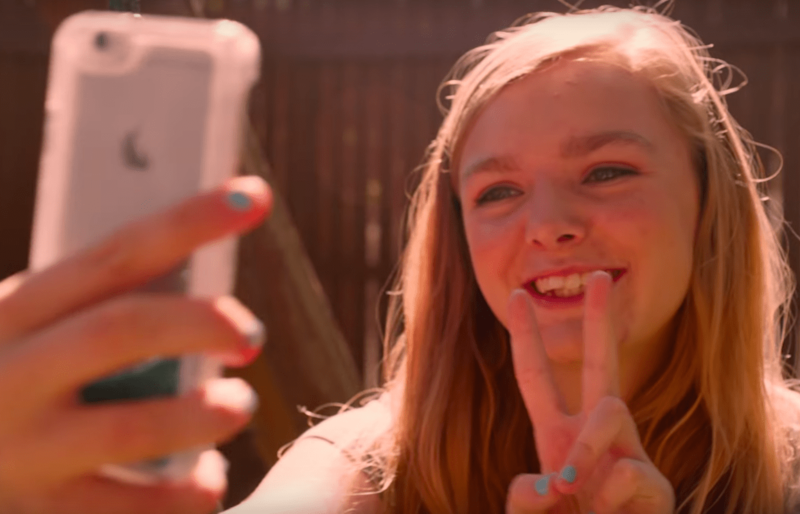 Eighth Grade Review: Solid debut that barely gets a passing grade – AiPT! Eighth Grade attempts to become another classic tale of growing up. Coming-of-age stories are popular in Hollywood. Written and directed by Bo Burnham, Eighth Grade attempts to become another classic tale of growing up. Burnham’s debut gets off to a wonderful start, before a generic third act almost ruins all the good marks received early. What separates Eighth Grade from other coming-of-age movies is that it is not so much about the passage from childhood into adulthood (the lead character Kayla Day is only going from middle school to high school, after all) and is more a character study. Kayla is socially awkward, shy, and lacking in confidence. She has few friends (this is learned in a humorous scene early in the film) and is at the age where she does not want to spend too much time speaking with her father. Kayla also has her own YouTube channel where the audience sees a different side of her. She gives advice on how to gain confidence, socialize, and to make friends. Though she is not a natural in front of the camera, it is very obvious that she feels most at ease recording her show. In a clever bit of writing, many of the shows done by Kayla narrate the film’s action. It is cute and shows how the soon to be high school freshman is trying to open up. The character is a trope of the genre and the only reason she works so well is Elsie Fisher’s stellar performance. Fisher plays the role with an effortless awkwardness that brings the character to life. One of the main draws of character driven movies is their ability to bring the audience into the film. Watching Fisher is more like reliving a memory than watching a performance. The young actress is also great in Kayla’s most confident moments. Even when speaking in front of her webcam, Kayla speaks with many pauses and crutch words. Fisher is so natural it is almost as if she is doing them impromptu. During a climatic scene at the end of the movie, she still cannot look people in the eye. However, it does not come off as a sign of weakness and just further proves that Kayla is still adjusting. Fisher’s performance is the highlight of the movie. Josh Hamilton plays Kayla’s father and more than hold his own. Mark Day is one of the most delightful characters to be seen on screen this year. Again, this is a product of the acting as the character is a generic kind single father. Hamilton is a treat in the role, sometimes being the proud dad while other times being as awkward as his daughter. The two have great on screen chemistry that bolsters both performances. The running theme of Eighth Grade is the poor writing. As great a job as Fisher and Hamilton are able to do with their characters, they are at times hampered by the writing. Little is know about Kayla, while nothing is known about her father. Other characters are there just to fill space. There is the mean popular girl, the crush who turns out to be a pervert and so on. Most egregiously, there is a twenty minuet span in the movie involving high school students that is never adequately explained and ends in a long uncomfortable scene that accomplishes little. Eighth Grade has its heart in the right place and starts off with lots of charm and laughs. Unfortunately, the writing is unable to sustain an interesting story despite its short runtime. Burnham’s film would have been better if it studied classics of the genre instead of copying them. The movie gives a realistic depiction of middle school and there are some strong performances, but there is little else to see. Elsie Fisher and Josh Hamilton are spectacular in their roles. Really funny moments early in the movie.